There is no need to explain why cannabis is excellent for your health. Marijuana is used all over the globe to treat a wide range of health issues including neurological, neurotic, physiological, and even oncological diseases. While the vast majority of people believe that the only way to consume cannabis is smoking, true enthusiasts employ other methods such as inhaling vapors, eating dishes cooked with cannabis oil, and drinking a cannabis tea. You may not believe it, but marijuana tea is an ancient concept known throughout the Middle East and Asia. If you want to learn how to make marijuana tea, you’ve come to the right place! Throughout years, thousands of people created exciting recipes, and we want to share some of them with you. Marijuana is a versatile plant that contains a plethora of useful compounds including famous THC, CBD, and CBN. These microelements are called cannabinoids. They affect human brain on multiple levels and provide various effects including psychotic and sedative ones. Marijuana has been consumed by smoking for thousands of years. However, there are many other potential ways to use this fantastic remedy. The issue with smoking is that, despite the claims from the cannabis community, inhaling smoke particles such as resins is never a positive thing to do. As an alternative, many started using cannabis oils. Adding it to various foods and mixtures for hookahs is an excellent way to consume cannabis, but we can do better! Weed tea is a perfect way to integrate cannabinoids for both therapeutic and recreational use. Does weed tea get you high? Absolutely. Any substance that contains THC will provide a notable psychotic effect. Cannabis teas for anxiety are a great way to relax after a long work day. Since you don’t contaminate your body with smoke particles, the effects of drinking are mostly positive. At the same time, a cannabis drink usually doesn’t have the strongest odor that a thick marijuana smoke leaves behind. After drinking cannabis tea, the pain will disappear quickly, and the psychotic effect will be apparent within minutes. Marijuana tea for nausea is a great way to consume useful cannabinoids during a chemotherapy session. Smoking is not a good option during chemo since it makes other people inhale the smoke or causes undesired side effects. Drinking a tea or taking a pill of CBD, on the other hand, is a much healthier solution. A weed tea has a plethora of upsides making it a great way to use cannabis. If you do not like smoking in general and want to enjoy the benefits of medical marijuana without any downsides, tea might be your best option. So, let’s learn how to make marijuana tea! The vast majority of people new to the “trees” community do not know that you make a marijuana tea just like you make any other tea: pour some hot water on the leaves and wait for a couple of minutes. However, the process is not that easy and requires both patience and preparation on your side. While most microelements are soluble in water, the oils should have something to bind to when they are released via heating. Cannabis oil molecules attach themselves to other forms of oils meaning that you will need a binding agent and the tastiest of them all is butter. Another important thing is that THC that gives you that high is not released naturally. Another compound, THCA, must be transformed into THC via heating. It is the reason why smoking gets you high. The process is called decarboxylation; weed decarboxylation is a process that occurs when you apply heat to the raw product. With all these neat details in mind, let’s get started with tea making! Teas for anxiety, sadly, require some time to be ready. Anxious people may not appreciate this little fact. However, you can make some weed tea beforehand and heat it in a microwave later. Butter particles may lump during the solidification process meaning that you will need to bring it back to its liquid state. Microwaving is a great way to do it. Prepare ingredients: 2 sticks (8 ounces) of unsalted butter, 5 ounces of weed, 2 cups of water, and 1-2 tea bags. Put butter and water in the same boil and bring it to boil. Put weed leaves in a pan, crush them slightly and pour over the mixture of water and butter. Stir the mixture one in 5-10 minutes over an hour and leave it to rest under a lid in-between stirring. Strain the mixture through cheesecloth to remove excess butter from the mixture. Rinse the leaves with hot water to remove all butter residue. Cool the mix together with butter residue in a freezer to separate water from weed-infused butter and store it in a separate container. Prepare some tea and add a teaspoon of butter. The drink will be creamy and thicker than your regular brew. Also, it will make you high and relaxed! This is a basic weed tea recipe. It works for everyone and doesn’t take that much time to prepare. You can dramatically change the experience by adding flavorings and adjusting the method according to your preferences. For example, you can add fruits and sugar to the drink or infuse the butter with additional aromatics and herbal extracts. 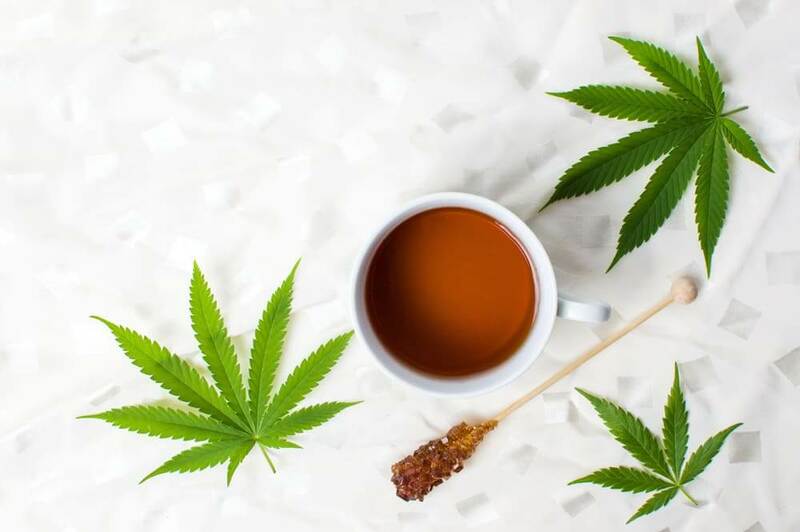 Cannabinoids do not conflict with natural flavorings and sugars meaning that you can experiment and use all your favorite tea making techniques to create tasty recreational marijuana teas. It is also a good idea to add some mildly sweet flavors to a cannabis tea for nausea since some people do not feel like drinking anything during chemo. Smelling some of their favorite odors can make drinking a pleasant experience. You will have a beautiful ice cube tray filled with portion-sized blocks of butter that you can take out as needed and use to make a portion of weed tea. Another critical thing to note: the butter block must dissolve in hot water entirely before consumption. Wait for it to homogenize with the tea before enjoying your healthy drink! Using an ice tray is a neat party trick as well as an efficient way of storing the product.